The Ford E-150 Econoline van was manufactured between 1961 and 2014, and these vans were the second longest running nameplate from Ford. 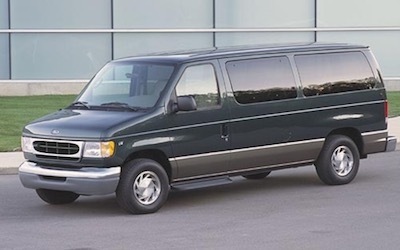 When you need Ford E-150 Econoline parts, FordPartsOnSale.com has the parts you need. We carry all the genuine OEM E-150 Econoline parts you need to keep your van running. Belts and Hoses – The belts and hoses keep your engine running smoothly. They do wear out over time and should be checked regularly. We have replacement belts, hoses and filters. Floor Mats – The floor mats protect the carpet in your Ford and keep the interior from showing a lot of wear. This helps your resale value. We carry floor mats and other interior accessories. Cargo – Keep the cargo area neat and tidy with cargo organizers that stop things from sliding all over the inside of your van. We have nets, boxes, and even roof racks. We have a large inventory on hand and aim to ship same day whenever possible. Order today.